A digital feedback method is designed in the experiment. By fitting the signal, computer gives the feedback amplitude and direction, so that the laser frequency is locked. The overlaps of the fluorescence peaks among partial Bose and Fermi isotopes are eliminated by using an half-wave plate (HWP) to change the spatial observation angle between the polarization direction of excitation light and PMT detection. Ytterbium (Yb) optical lattice clock is a very valuable research. In 2013, research group of NIST in America realizes a clock with milestone instability up to 1.6*10-18. Also in this year, the measured clock transition of 171Yb lattice clock is accepted as the secondary representation of the definition of the second. Research group led by Lingxiang He from Wuhan Institute of Physics and Mathematics, Chinese Academy of Science introduces a base skill toward Yb lattice clock to eliminate the fluorescence spectra overlap between the partial Boson and Fermion isotopes, when atomic beam is excited by 399 nm laser. It is reported in Chinese Optics Letters Vol. 12, No.2, 2014 (http://www.osapublishing.org/col/abstract.cfm?uri=col-12-2-021401). The research focuses on the difference of sensitivity of fluorescence intensity to the observation direction of Yb Boson and Fermion isotopes. The difference can be used to eliminate the spectra overlap, making the fluorescence spectra as reliable frequency reference and to be successfully used for frequency locking. Linearly polarized 399 nm laser is used to excite the 1S0-1P1 transition and fluorescence spectra are recorded with photomultiplier tube (PMT). Relative spectra intensity of Yb Boson and Fermion isotopes can be controlled by the angle between the linearly polarized excitation laser and the observation direction. When observation direction is parallel to the linear polarization vector, fluorescence spectra of Boson isotopes almost disappear completely. 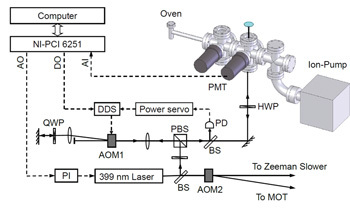 In the experiment, the researchers have succeeded in locking the 399 nm laser to a well resolved transition and obtained frequency stability around 304 kHz. There exist partial fluorescence spectra overlaps of Yb Boson and Fermion isotopes when excited by 399 nm linearly polarized laser, which is bad for frequency locking based on these transition peaks. The feature of this work is to utilize the dependence of fluorescence spectra on observation direction to eliminate the spectra overlaps and well resolved transition peaks of Fermion isotopes can be used as the reliable frequency reference for required frequency locking. The method can serve high performance optical lattice clock. Based on the method, precise and stable frequency locking of Yb Fermion isotopes is realized, enough atoms are loaded into 759 nm (magic wavelength) optical lattice after two-stage cooling. Finally, above 104 atoms are collected in optical lattice with temperature around 15°, which paves the way for the detection of the 578 nm clock transition.